It’s Art, But Is It Heraldry? It's Not a Coat of Arms, It's a "Shield"
It’s a little different from the usual heraldic dictionary, in that it does not give you a listing of all of the names of the tinctures, lines of division, common charges, etc. Those can be found in just about every heraldic dictionary ever printed and/or placed on-line. (Indeed, several of these can be found through links in the left-hand column of this blog, under “Some Good On-Line Heraldry Books”.) 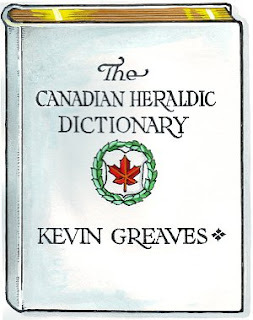 Where this Dictionary is different, and thus where it becomes especially useful in the study of Canadian heraldry, is in its definitions – with illustrations from actual grants of arms – of lines of division and charges found only in, or very rarely outside of, Canadian heraldry. It’s a great resource, and I recommend it to anyone who is interested in the ways in which heraldry is being used, and incorporating new charges and lines of division,* today. * Not that the addition of charges and lines of division is anything new to the field of heraldry. See, for example, my article “New Directions in Heraldry” which can be found on-line at http://www.baronage.co.uk/2002d/appleton.pdf and http://www.appletonstudios.com/Congress2002DBA.pdf You may also use the link to the article in the left-hand column of this blog under “Articles I’ve Written”.